Acne vulgaris, which we commonly know as acne only, is a disease of the skin with specific characters of its own like pimples (both papules or pustules), comedones (blackheads and whiteheads) and a greasy skin. Acne can be with or without scarring. Usually scarring results due to cystic acne or when the pimples are scratched or squeezed, so avoid doing that. Acne might not be a fatal or lethal disease on its own. However the consequences of having cosmetic disfigurement of your face and skin can be devastating. A person usually ends up having anxiety, low self-esteem, depression, etc. Some patients might even develop suicidal thoughts just because of the emotional set back due to acne, which it shouldn’t! As it’s perfectly treatable, and even if it wasn’t, life has more than just smooth facial skin to give us to make us happy. A comedo is clogged hair follicle, or a pore on the skin. The follicle gets clogged due to the skin debris (keratin) and oil on the skin. Comedo itself doesn’t mean acne. A comedo can occur without acne. However it can result in inflammation and infection of the follicle and result in acne easily. Teenage is usually considered to be the major cause of acne. As during teenage, when the person hits puberty, there are various hormonal changes that occur in our body. These hormonal changes result in increased sebum production along with greater proliferation of the skin cells. This can result in acne easily in teenagers. However, acne is not confined to this age group only. There are various other factors that lead to acne too and can affect people of varying age. Hereditary – acne is usually associated with genetics, as various factors leading to acne formation are gene coded and passed on through genes. It’s important to understand that acne isn’t caused by just one reason, thus its treatment varies from person to person based on the underlying cause of acne. If you’re suffering from acne, consult a doctor to get expert opinion regarding the type and cause you’re suffering from and then get appropriate acne treatment, best for your specific condition to stop its propagation and to cure it. Based on the underlying cause, acne can be classified into different types. Treatment usually varies according to the type of acne and also includes treating the underlying cause too. The term comedo refers to a clogged hair follicle on the skin. Clogging of a pore is more common in oilskins. A comedo gives an appearance of bumps around the skin. They’re more common in the facial skin T-zone. If the comedo is open, it results in blackheads, if closed it results in whiteheads. A comedo can be with or without acne. A comedo can get inflammaed and infected easily and result in a pimple formation. Clogging of the hair follicle is a common reason for acne usually. However clogging itself doesn’t end up in acne usually. Body’s inflammatory response to the comedo in clogged hair follicle is the main reason for pimple formation. Inflammatory acne is more common in males. This is because their skin produces more oil due to higher testosterone levels in their body. Inflammatory acne might not have an obvious reason always. One might see a pimple pop up one day when they wake up from sleep. However, there is a clogged hair follicle usually that gets inflamed as a result of irritation caused by the wax and oil in the clogged pore, causing acne. Cystic acne is a serious form of acne and involves deep inflammation of the skin. It’s the most severe form of acne and can cause scarring if not managed properly. Cystic acne affects a very small percentage of people, almost 0.2%, as compared to general acne that affects almost 7% of the population. Cystic acne should be diagnosed and treated as early as possible to avoid any scarring and spread. The cosmetic disfigurement caused by cystic acne can result in a huge emotional set back and impact the social life of the patient. Cystic acne includes both infection and inflammation. The infection is caused by a bacterium. Cystic acne causing bacteria is called P. acnes. The bacteria infect the hair follicle and a papule is formed. When this infected pore gets inflamed due to body’s inflammatory response, it forms a pustule, appearing as a red, swollen bump on the skin. If the pustule of cystic acne is left untreated, the inflamed hair follicle can rupture, releasing its contents to the skin around it. The released material itself triggers a chain reaction of inflammation in the hair follicles around it, resulting in a much wider, deeper and painful cyst. Acne due to hormonal changes is more common in females, especially in their late 20s or during 30 years of their age. These women may not have acne earlier in their life. Hormonal acne is considered to be due to a drop in estrogen levels. It involves the lower third of the facial skin usually, making a U-shaped pattern involving cheeks and the mandibular skin. In this type of acne, pimples appear usually just before, during or after the menstrual cycle. It’s important to understand that the bacteria causing acne aren’t harmful on their own. Some of the strains causing acne are found to be generally helpful for our skin. Therefore it’s not recommended to start applying “kill all bacteria” soaps and face washes. It may result in devastating results, including the infection from opportunistic organisms including fungi and then getting rid of the fungal infection on the skin would be a new pain for the patient. Always consult an expert dermatologist to discuss the best possible treatment in your specific case before applying any chemical on the skin or starting self-medication. 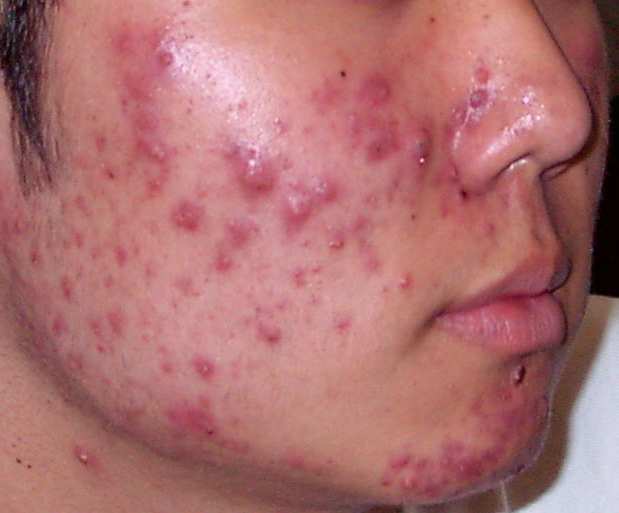 Treatment of acne isn’t “one fit for all”. It varies based on the type of acne and the underlying cause. If you’re suffering from acne, don’t start self-medication, rather consult a doctor so that he may diagnose the type of acne you’re having and come up with the best management and acne treatment in your specific case. Drink plenty of water, minimum 8 glass of water is necessary. Avoid using strong chemicals of any sort on your skin. Various medicines and drugs are available for acne treatment. However, remember not to start treatment for acne on your own and always consult a doctor before using any medicine yourself. Each medicine has it own side effects, especially during pregnancy. Remember that the medicines and drugs not only affect the skin, but also affect various parts of the body including heart, kidneys, liver, etc. Therefore always seek medical advice before using any medicine on your own. Your doctor might advice excision of the cyst surgically in cystic form of acne. It’s a simple and minor procedure in which a small incision is made on your skin and cyst is removed. Remember, the patients should never try this themselves as it requires expertise and if done incorrectly, can result in spread, recurrence, worsening of the cyst or even scarring of the skin. If you’re having acne on your face or any other part of the body, don’t panic. Don’t scratch, squeeze or pick the pimples or pustules and never self-medicate. Visit an expert dermatologist to discuss the best possible management and acne treatment options available for your specific case to get rid of acne on your skin without any harmful affects. I was under medication and that dermatologist had asked me to take medicine called “roaccutane” but my situation became worse and im still bad even after one month of medication. Best thing is to follow up with your dermatologist physically and show them your skin and how the medicine is affecting it. You can also show some other dermatologist for second opinion too. What exactly you mean by getting worse? Acne increased or skin became irritated? Please explain. I’m sorry to hear that Netto. Did you inform the doctor who gave you that medicine about this condition? Did you consult any other dermatologist? If you want to discuss the issue with me let me know I’ll email you and we can communicate. Yes I have informed the second doctor about my medicine and its effect and he advised me to take a laser treatment and i did that too!! But acnes are still coming..